He’d kill us if he had the chance. This ominous phrase lies at the center of the plot in Francis Ford Coppola’s brilliant 1974 thriller “The Conversation”. The film tells a story about listening. 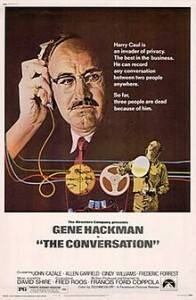 Gene Hackman plays Harry Caul – a surveillance expert with a unique ability to record private conversations. He’s a clever investigator and he’s skilled at manipulating (the hilariously analog) 70s-era surveillance technology. After bugging a particularly important conversation, Hackman’s character spends hours and hours listening to the tape in search of answers. But he doesn’t really listen. And people die as a result. Too often we only hear what we want to hear. Or we listen to the wrong conversation. Or we listen to too many conversations. Or we don’t understand why we’re listening in the first place. Listening will kill you if you give it the chance. Eric Boggs is the Founder & President at RevBoss, a B2B outbound sales software and services company. He’s also the founder of Argyle Social and the co-founder of the Social Pros Podcast.